Painting the kitchen table is no small chore. Not only are you taking on a transformation of the most used piece of furniture in your home, but you’re also eating on paper plates while sitting on buckets until it’s done. Needless to say, it’s the type of job that you want done correctly and quickly. The last thing you want is to spend all the time, money, and sweat painting your kitchen table only to be less than pleased with the final result. 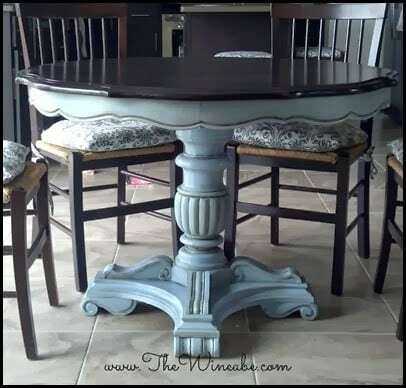 I’ve rounded up the best of the best kitchen table colors so you can paint with confidence knowing that you’ll absolutely love the finished product. When you have an idea of what color you want, don’t forget to read The 4 Biggest Mistakes People Make When Painting Their Kitchen Table. 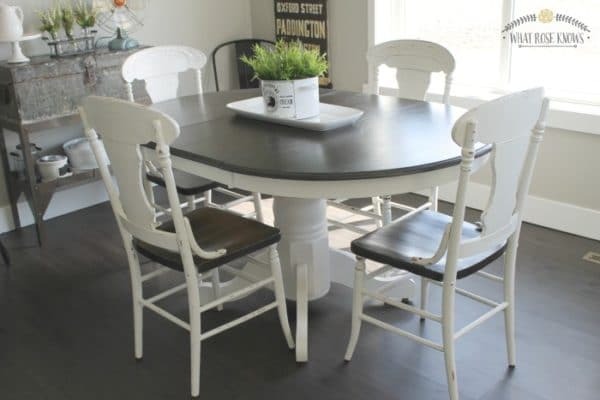 The standard farmhouse look of white paint and dark stain is perhaps the most popular kitchen table makeover today. Just take a quick search on Pinterest and you’ll see approximately 412 examples of similar style. It’s classic and beautiful and made with Minwax stain in ebony and a high quality paint and primer in one for the chairs and base. The dark tabletop is forgiving, while the chairs and legs help lighten the kitchen. This is my favorite combination for a farmhouse styled kitchen. 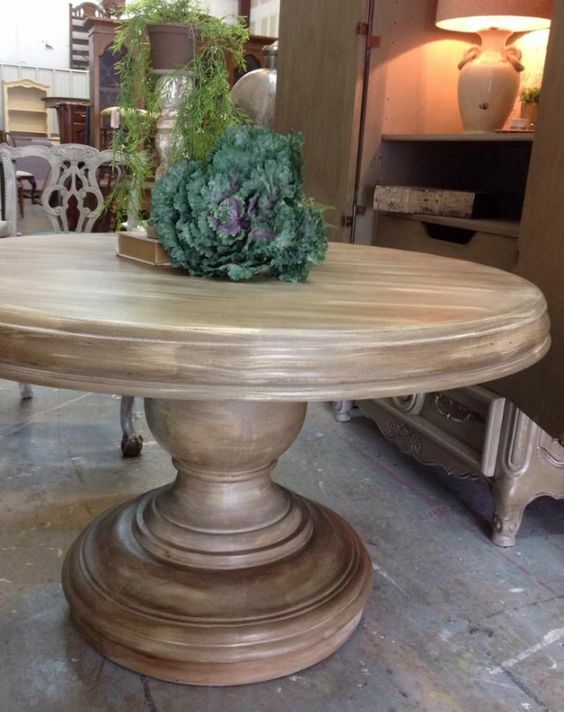 If you’d rather have a solid wood look to the table, you can create a beautiful finish with chalk paint in Coco, Old Ochre, and then the combination of clear and dark wax to create a layered look that is absolutely stunning. Color in the kitchen is a trend that is definitely here to stay. 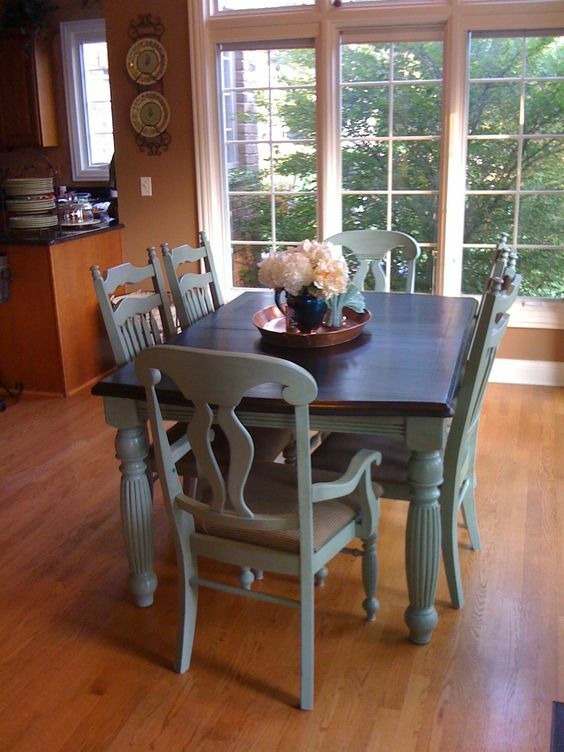 Hands down, the most popular color for kitchen tables is in the green or blue family. These hues give a calm shade to the kitchen and coordinate well with other styles, and hardwood flooring. 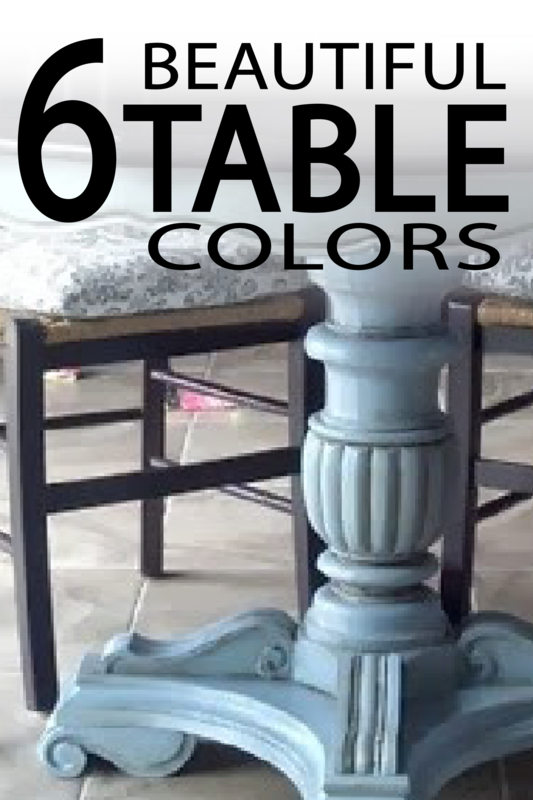 This first table is painted in a chalk paint color, Olive. 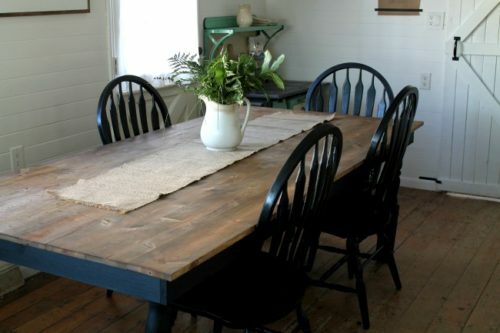 The dark stained top looks beautiful, but it also is more durable than a painted table top. If you love the white kitchen look, (and who doesn’t? ), colored chairs pair perfectly. The white in this set is one of my all time favorites, Swiss Coffee by Glidden. The chairs are beautifully spray painted in Jade by Krylon. 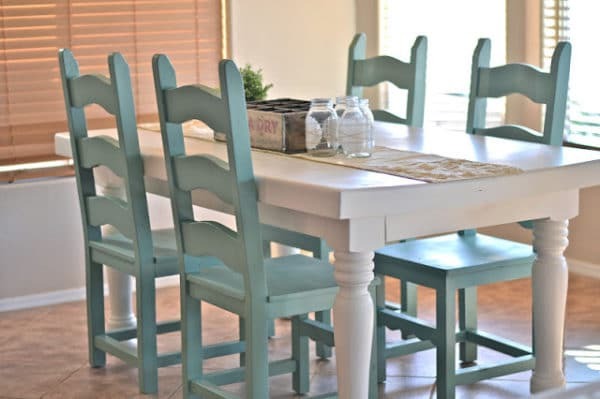 If you are lucky enough to have a beautiful wood kitchen table top, there is no reason why you have to paint it when you’re ready for an update. Sometimes all it takes is to paint the base and chairs and leave the rest as is. It creates a beautiful farmhouse chic look that any kitchen would be lucky to have. 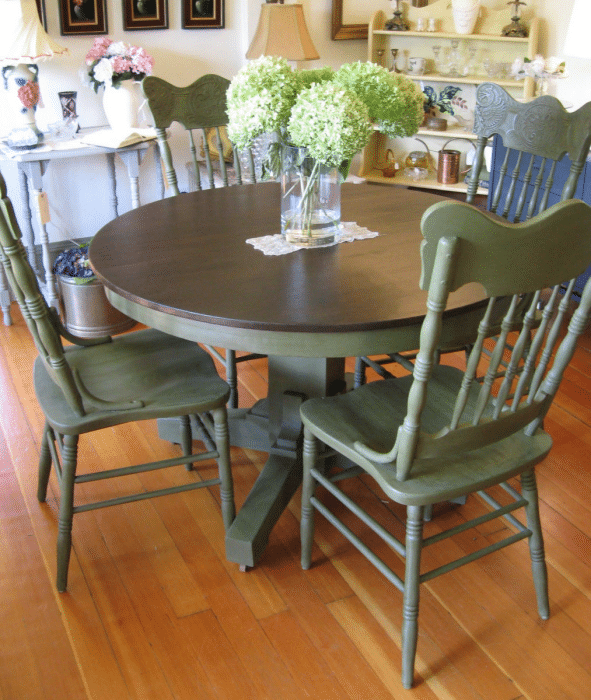 Choosing paint colors for kitchen tables can seem so daunting, but remember you can always paint it again. Try something new and let me know how it goes! If you have a favorite paint color you are aching to try or have just used, let me know in the comments below!